UPDATE: TPC debunks Feldstein. Here’s their analysis of the myriad ways Marty went wrong. It is still the case that Gov Romney tax plan will either increase taxes on households with incomes below $200K or not be revenue neutral, which I believe will lead to larger structural budget deficits. Based on the “you-can-have-it-all” campaign they’re running and the Norquist choke hold, I don’t believe that under an R administration taxes will rise or investment tax preferences will be reduced. That leaves less revenues and despite their antipathy toward government spending, history suggests that supply side tax cuts like these lead to larger budget deficits that persist even as the economy expands. Re Gov Romney’s controversial tax plan, how can both this be true and this be true? The first link shows yours truly using very high tech videography (my production asst on this was 10 years old, btw) to demonstrate that there’s not enough revenue in the loopholes to make up for the lost revenue in the tax cuts. The second, an oped in today’s WSJ, argues that there is, in fact, more than enough in the loopholes to offset the rate reductions. Of course, they can’t both be true. Economist Marty Feldstein gets the result he seeks by changing the parameters of original TPC research upon which my vblog was based. I’m sure the TPC will respond to Feldstein in greater detail but let me focus on one sleight of hand, or, to be more generous, a portentous change Marty makes that partly drives his result. Moreover, he does so without informing the reader how this is quite different from the way the TPC did the analysis. The TPC argues that you can’t replace the revenue lost by Romney’s cuts on households with incomes above $200,000 by closing the tax expenditures from which they currently benefit. Basically, you lose $251 billion in revenue but there’s only $165 billion in tax expenditures that go to that group, so to maintain revenue neutrality, you’d have to raise taxes on somebody else. 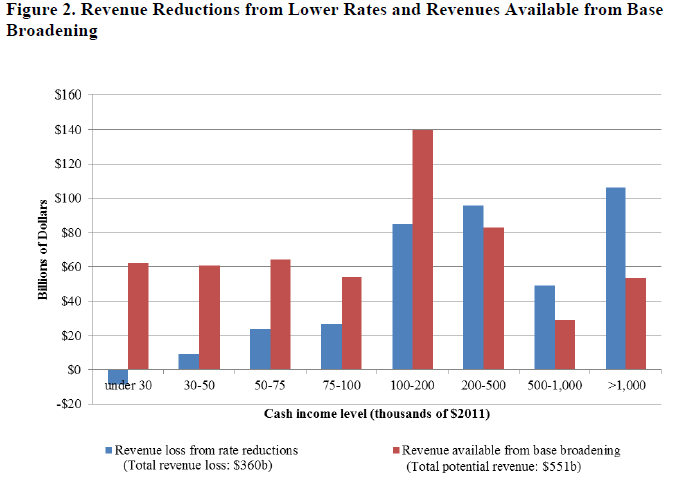 This can be seen in TPC’s figure below in that for each income class above $200K, the blue bars (revenue reductions from lower rates) are taller than the red bars (revenue from “base-broadening,” or loophole closing). The opposite pattern prevails for all the other income classes. It’s this last point that Marty must have noticed, because his case partly rests on defining $100K and up (not $200K) as upper-income. Once he defines things that way, he gets more of the revenue he needs (he also manages to shrink the revenue losses relative to TPC, so he’s got a smaller glass to fill as per my vblog). Now, part of what we’re all struggling with here is the fact that Gov Romney hasn’t specified his plan, so maybe when he suggests he’ll pay for his high income rate cuts by broadening their tax base, he’s defining high income by $100K and up, not $200K. As you see, this makes a very big difference. You’re now talking about cutting tax expenditures currently enjoyed by more than three times as many tax filers as you were before (see figure). If that’s what the R’s are contemplating here, it would be…um…quite germane to the debate. To be clear, I’ve consistently stressed that raising ample revenues will eventually mean going beyond the tax increases from allowing the Bush cuts to expire for households above $200K or $250K. But a) we should start at the top of the scale, as Senate Democrats have supported, while R’s have been deeply unwilling to go there b) I’d wait for the economy to improve before hitting lower income brackets with higher taxes, be it rates or base, and c) no one should take any of this base broadening seriously until those who espouse it get specific. This last point is the most important. 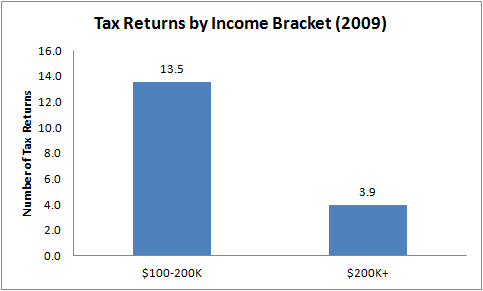 It’s the well know tax-reform trap that we’ve written about here at CBPP. In today’s climate, tax reform that’s premised on lower rates paid for by broadening the base risks ending up with a lot of the former and little, if any, of the latter. Remember, Rep Paul Ryan refused to support the allegedly beloved Bowles-Simpson because it raised taxes—which it did by broadening the base to pay for rate cuts. So this whole debate is a bit of a blindfolded Kabuki dance. But given that, if you model R-style tax reform in a way that’s consistent with what we know and can reasonably surmise of their proposals, the TPC’s numbers consistently hold up. Share the post "TPC, Feldstein, and Tax Reform"
5 comments in reply to "TPC, Feldstein, and Tax Reform"
After decades of hearing about GOP charity works – not government, Martin “Trickle Down” lets the cat out of the bag. It’s really all about greed for the rich and their families – not creating jobs, endowing colleges, giving to churches and synagogues. As for paying taxes on the inheritances, you don’t pay capital gains until realized, dividends until received. Wait a minute. Mitt and Martin also want to eliminate all dividend and capital gains taxes. So, what vapor is the economic genius Feldstein selling? No taxes on estates and no taxes on investments and no donations to charity? Pardon me for being a bit confused and weedy, but this post sparks my Inner Information Designer, and I have questions – mostly about the vblog with the two glasses of water. CBPP compares two identical ‘glasses of water’ and concludes that they cannot possibly hold the same amount of ‘tax money’; consequently, the tax loophole revenues can never fill the ‘amount drained’ by tax expenditures. CBPP bases its analysis on households >$200,000. However, Feldstein claims that the closed tax loopholes (revenue) ‘are equal’ to the tax expenditures – as if the amounts are equivalent. Unfortunately, instead of using two identical glasses of water as the basis for his comparison, Feldstein is probably comparing one 16 oz glass of water (Tax Expenditures) against one 3-inch high shallow glass bowl (i.e., revenues from more taxable households > $100,000). In Feldstein’s analysis, each piece of glassware may be ‘3/4 full’, but that does not mean they hold equivalent amounts of liquid, nor of tax revenues. Feldstein may be comparing a 16 oz glass against a 10 oz bowl. The fact that ‘each is 3/4 full’ does not mean they hold ‘equivalent amounts’. This kind of squishiness and confusion leads to trouble. Yet the current vblog shows us only the two glasses – per the CBPP analysis – that appear to be roughly similar, which makes it a bit tough to make the intellectual leap to the fact that Feldstein’s claims are probably based on comparing Glass #1 against a shallow bowl. But Feldstein is *not* comparing equivalent things; he’s comparing a 16 oz glass to some kind of bowl, which in order to fit in all the additional households between >$100,000 and >$200,000 needs to be a largish, shallow bowl. In other words, these two things are not equivalent. People like me need to *see* that. I think that if the talented 10-year old videographer could be enlisted again, a revised video could do a lot of good in unpacking the nature of the problem with Feldstein’s analysis — assuming that I have sussed out what is puzzling me about this post and linked video. 1. I had to peer at my computer screen to make out the relative heights of clear water in the two glasses in that video. Any chance for a reshoot, and this time use cola or root beer? ** A darker liquid would make it easier to see comparisons at-a-glance. 2. Is there any way in a reshoot video to make sure the viewer knows that Glass #1 and Glass #2 are ‘exactly identical’ in shape and size for the CBPP analysis? I think the intention in this version of the video was to show: large glass != small glass; however, I would find it more useful to see comparisons between two identical glasses of liquids as the basis of the Comparison #1: The CBPP Analysis, and then in contrast, Comparison #2: The Problem With Romney-Feldstein’s Metrics in their Analysis, compare a 16 oz glass to a 10 oz shallow bowl. 3. Does the left glass (from viewer’s perspective, Glass #1) represent the $251 bn figure? If so, why not put up a little tag in front of that glass to state the amount? Is the right glass (Glass #2) the $165 bn figure? If so, please show us. Apologies for such a long comment. The video is a terrific idea, and the topic matters. ** Far be it from me to advocate anyone drink sodas made with high fructose corn syrup. However, there are colas and root beers made with cane sugars. The point being that the height of the liquid would be **a lot** easier to see on the video if it were a dark, opaque liquid. Many good ideas here! I’ll see what I can do. As I understand – and from reading Feldstein’s piece – he says “apply a 30% marginal tax rate to the $636 billion”. But as Brad DeLong points out and as anyone with eyeballs can see, that is current law, not what the tax rates will be if Romney has his way. (He’s taking an average tax rate assuming a top rate of 35% to get to 30%.) Feldstein says, “Extra revenue of $191 billion—more than enough to offset the revenue losses from the individual income tax cuts proposed by Gov. Romney.” But that isn’t possible in the Romney plan because the tax rates would drop. If it’s a 20% drop, then using the same best-for-Romney numbers, you can’t make it work at all. He’s like $36B off taking the absolute best case. I can’t understand how that got printed with such an obvious mistake. I gather Mankiw linked to it without comment. I’d bet he saw the mistake but since he’s decided being a political hack is more important than honesty, he wouldn’t mention it out loud. That’s giving Mankiw too much benefit …. he uncritically links to any BS that supports his team.